In June 1953, North American initiated an in-house study of advanced F-100 designs, leading to proposed interceptor (NAA 211: F-100BI denoting "interceptor") and fighter-bomber (NAA 212: F-100B) variants. Concentrating on the F-100B, the preliminary engineering and design work focused on a tactical fighter-bomber configuration, featuring a recessed weapons bay under the fuselage and provision for six hardpoints underneath the wings. Single-point refuelling capability was provided while a retractable tailskid was installed. An all-moving vertical fin and an automated flight control system was incorporated which permitted the aircraft to roll at supersonic speeds using spoilers. The flight control system was upgraded by the addition of pitch and yaw dampers. The aircraft's most distinguishing feature is its dorsal-mounted Variable Area Inlet Duct (VAID). While the VAID was a system unique to the F-107A, it was an early form of a variable geometry intake ramp which automatically controlled the amount of air fed to the jet engine. Although the preliminary design of the air intake was originally located in a chin position under the fuselage (an arrangement later adopted for the F-16), the air intake was eventually mounted in an unconventional position directly above and just behind the cockpit. The VAID system proved to be very efficient and NAA used the design concept on their A-5, XB-70 aircraft and XF-108 Rapier designs. The air intake was in the unusual dorsal location as the USAF had required the carriage of an underbelly semi-conformal nuclear weapon. The original chin intake caused a shock wave that interfered in launching this weapon. The implications this had for the survivability of the pilot during ejection were troubling. It also severely limited view to the rear. Although this was not considered terribly important for a tactical fighter-bomber aircraft, it is characteristic of the era, when it was assumed air combat would be via guided missile exchanges outside visual range. 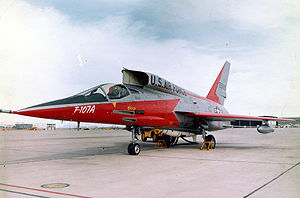 The first F-107A (s/n 55-5118) with North American's chief test pilot Bob Baker at the controls, made its initial flight on 10 September 1956, attaining Mach1.03. Although successfully carrying out its flight, the brake chute did not deploy, which resulted in a "hot" landing with the nose gear strut breaking. The aircraft first achieved Mach2 in tests on 3 November 1956. At the conclusion of the F-107A's successful test program, the Tactical Air Command decided to hold a fly-off competition between the F-107A and the Republic F-105 which was designed to same mission requirements and used the same engine. Although the competition was close, the F-105 was selected as the new standard TAC tactical fighter. The three F-107A prototypes were relegated to test flying while the pre-production order was cancelled.